Former St.Kitts CMO Dr. Patrick Martin has issued a statement regarding tommorow’s Solar Eclipse. The Medical Doctor listed a number of precautions that citizens must stake or should take to protect themselves and in particular their eyesight during this spectcauly and rare event. 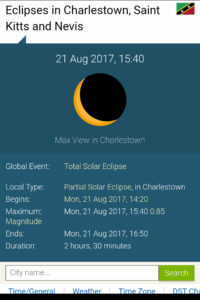 On Monday, August 21, 2017, St.Kitts-Nevis will witness an eclipse of the sun for the first time in 99 years, where the Moon will pass in front of the Sun casting darkness across swathes of the Earth’s surface. The Solar Eclipse is the moment when the Sun, the Moon and the Earth become perfectly aligned in a once-in-a-lifetime celestial spectacle seen from the Pacific Ocean to the Atlantic Ocean. Although we won’t see a perfect alignment in St.Kitts, we will be able to see a partial eclipse (where the moon covers only a part of the sun). The eclipse is predicted to occur approximately 2:21 pm on Monday and will last for over two hours. Everyone in the UK, North America, parts of South America, Africa, Europe and Caribbean will see at least a partial solar eclipse, where the moon covers only a part of the sun. However, 14 states across the United States will experience a total solar eclipse with more than two minutes of darkness descending in the middle of the day over the course of 100 minutes. More than 12 million Americans live inside the path of totality and more than half of the nation live within 400 miles of it. Millions more are expected to travel to cities along the path to witness the phenomenon.